I often associate food with the people I love. My mom makes the best Mexican food of any kind. My Aunt Rita makes the best rice and beans. My Aunt Eleanor makes the best sugar cookies. My Aunt Yolanda has the best party spreads ever. And my Aunt Lola makes the best Piña Colada cake. She makes this massive white cake and drenches it in piña colada mix. Then she tops it with Cool Whip and strawberries. Oh that cake is good. Our former intern at work, Kimberly, brought a version of that cake to work one day only she used a cream of coconut and evaporated milk mixture instead of piña colada. Holy moly that thing was unbelievably moist. Of course I had to make it. And you should too. In a mixing bowl, add cake mix, eggs, water, mayonnaise and vegetable oil. Beat together for about 3-4 minutes until mixed completely. Prepare two 8-inch round cake pans by greasing and flouring both pans. Evenly distribute cake batter into both pans. Place in the oven and bake for 22-25 minutes or until a toothpick inserted into the cake comes out clean. Meanwhile, in a medium bowl, mix together the evaporated milk and the cream of coconut. Set aside 1/3 c to add to the Cool Whip. Once cakes are out of the oven, place the bottom one on your serving platter. Make sure the platter has raised sides. 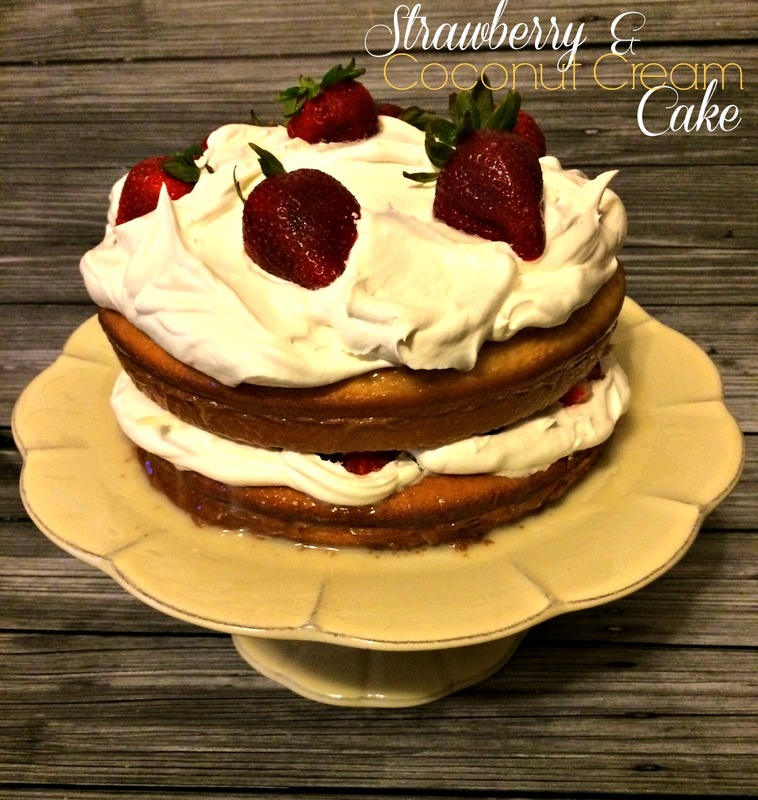 Poke holes into the cake then pour some of the coconut cream mixture on top. The more you pour, the moister the cake will be. Be aware it will drip along the sides. Do the same for the remaining cake, keeping in mind you will have to transfer the cake to the top of the bottom cake once they are cooled. While the cakes are cooling, add 1/3 of the coconut cream mixture to the Cool Whip. Fold in and set aside. Allow the cakes to cool completely then add about half of the Cool Whip to the bottom cake. Hull about five strawberries and add them to the top of the Cool Whip on the cake. Top the top layer to the Cool Whip covered cake. Add remaining Cool Whip to the cake. Decorate with remaining strawberries.